Starting a new job can be difficult as one adapts to new responsibilities, procedures, and expectations. Yet Tammy Anaya proves to be against this norm. 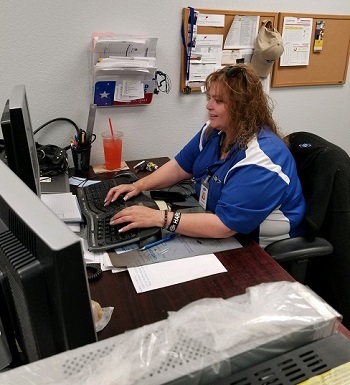 Tammy had worked as a Warehouse Technician in TDS cable in Carlsbad, New Mexico for several years, but in 2016, she started a new role as a Field Services Assistant. As a warehouse technician, Tammy would stage equipment to be sent out with the technicians and handle incoming deliveries and reports for the field technicians. But in her current role as Field Services Assistant, Tammy has even more responsibilities, including ordering supplies, entering goods receipts from deliveries, and drafting various reports requested by the Field Service Manager. It also involves her working closely with the current Warehouse Technician. However, for the first three months when she was transitioning to the Field Services Assistant, Tammy worked both roles at the same time. What would be an overwhelming undertaking for most was quite manageable for Tammy. Tammy would not have been able to do this without the supportive work environment she has been able to work in for the past 16 years. She feels she is always encouraged and pushed to do her best. In 2018, Tammy was named a TDS Inspiring Excellence award winner, which is awarded to less than 2 percent of the more than 3,000 employees at TDS.